I painted on four red envelopes with acrylic and gouache for Grumpy Bert's 2019 year of the pig themed Red Envelope Show at Flushing Town Hall in New York. Inspired by the festive Chinese dragon dance, I decided to paint a "pig dragon" dance performed by my favorite cat characters on water, decorated with water lilies and gold. I painted on four red envelopes with acrylic and gouache for Grumpy Bert's 2019 year of the pig themed Red Envelope Show at Flushing Town Hall in New York. 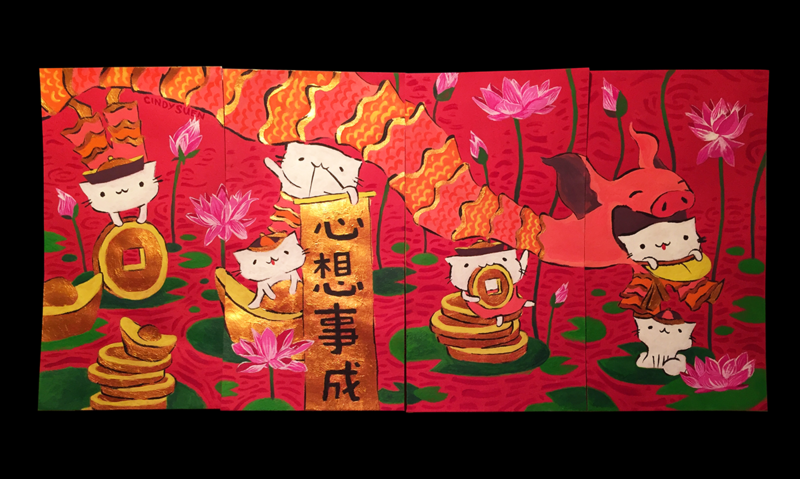 Inspired by the festive Chinese dragon dance, I decided to paint a "pig dragon" dance performed by my favorite cat characters on water, decorated with water lilies and gold. Once I finished painting the piece, I fell in love with the world I made, and knew I had to make it in 3D too. And so I did. I built the 3D world in blender cycles based on my original 2D red envelopes design, as shown in the top most video. I've also uploaded my animation onto Sketchfab, which I've embedded above. Check it out, zoom in and out , and drag around to explore more. I hope you enjoy! :) Happy Chinese New Year!